This document has so many dates! What do they all mean? Why are they all different? - Ask DAG! This document has so many dates! What do they all mean? Why are they all different? 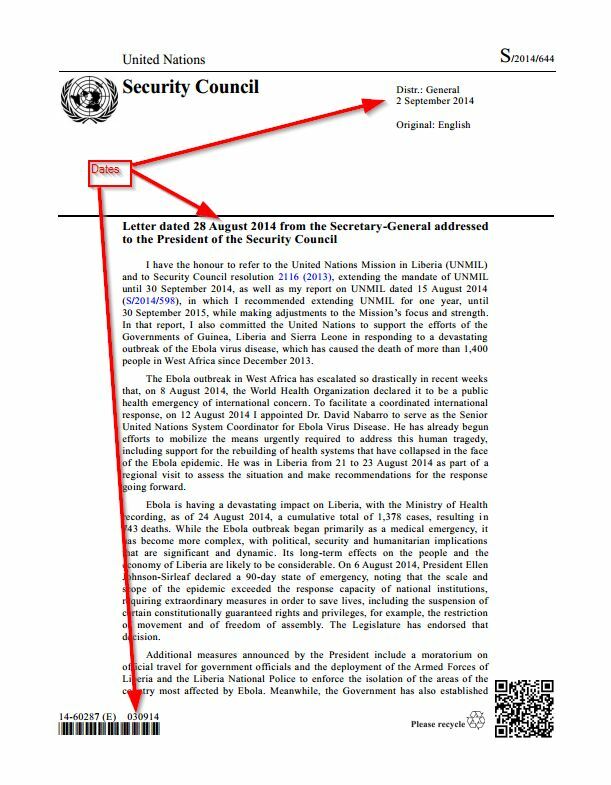 Some UN documents have several dates printed on them. At the top of the document, under the symbol in the masthead, the date indicates when the final edited text of the document was submitted for translation to other languages. All language versions of a document are issued simultaneously. Document processing, including editing and translation, takes time. All language versions are complete. The electronic versions are ready in the system for release. If the document is a letter, the date in the title is the date the author dated the letter. the editors finalized the English version on 2 September 2014.
the other language versions were completed on 3 September 2014. Variations in the amount of time to process individual documents depend on a variety of factors in the parliamentary process and the work of the Secretariat departments involved in document creation. The Library is not involved in the document creation process and can only refer to information in the published documents. This answer is based on the institutional knowledge of colleagues who have worked with documents over many years. We have not found another source, such as a document, containing this information.